Answer: A and B. Listening and learning are transitory port states, used only when moving from the blocking to the forwarding state. Discarding is not an 802.1D STP port state. Answer: C and D. Listening and learning are transitory port states, used only when moving from the blocking to the forwarding state. Discarding is not an 802.1D STP port state. Forwarding and blocking are stable states. Q3. Which of the following bridge IDs win election as root, assuming that the switches with these bridge IDs are in the same network? Answer: C. The smallest numeric bridge ID wins the election. Q4. Which of the following facts determines how often a nonroot switch sends an 802.1D STP hello BPDU message? a. The hello timer as configured on that switch. b. The hello timer as configured on the root switch. c. It is always every 2 seconds. d. The switch reacts to BPDUs received from the root switch by sending another BPDU 2 seconds after receiving the root BPDU. Answer: B. Nonroot switches forward Hellos received from the root; the root sends these Hellos based on the root’s configured Hello timer. Q5. What STP feature causes an interface to be placed in the forwarding state as soon as the interface is physically active? Answer: D. The PortFast feature enables STP to move a port from blocking to forwarding, without going through the interim listening and learning states. STP allows this exception when the link is known to have no switch on the other end of the link, removing the risk of a switching loop. BPDU Guard is a common feature to use at the same time as PortFast, because it watches for incoming bridge protocol data units (BPDU), which should not happen on an access port, and prevents the loops from a rogue switch by disabling the port. Q6. Switch S1 sits in a LAN that uses RSTP. SW1’s E1/1 port is its root port, with E1/2 as the only other port connected to other switches. SW1 knows that it will use E1/2 as its root port if E1/1 fails. If SW1’s E1/1 interface fails, which of the following is true? a. SW1 waits 10 times the hello timer (default 10 х 2 = 20 seconds) before reacting. b. SW1 waits three times the hello timer (default 3 х 2 = 6 seconds) before reacting. c. SW1 does not wait but makes E1/2 the root port and puts it in a learning state. d. SW1 does not wait but makes E1/2 the root port and puts it in a forwarding state. Answer: D. RSTP has several improvements over STP for faster convergence, including waiting on three times the hello timer when a wait is necessary. However, when the root port actually fails, both 802.1D and 802.1w can react without waiting (a fact that rules out two answers). Another RSTP optimization is that an alternate port (that is, a port that can be used as root port when the root port fails) can be used immediately and be placed into a forwarding state, without first spending MaxAge time in learning state. Q7. 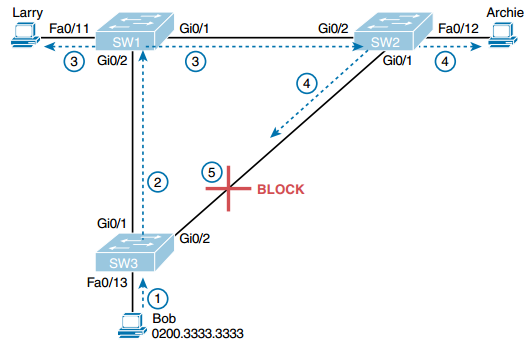 Switch SW1 sits in a LAN that uses RSTP. SW1 has 24 RSTP edge ports and is also receiving hello BPDUs on two point-to-point ports, E1/1 and E1/2. SW1 chooses E1/1 as its root port. Which of the following about the RSTP port role of E1/2 is true? Answer: D. RSTP refers to potential root ports to use when the current root port fails, an alternate port. The backup port role is used when one switch connects two or more ports to the same collision domain (for example, when connecting to a hub). Blocking (802.1D) and discarding (802.1w) are names of port states, not port roles.